I realize I am very critical of religion. So today I am going to give some "mad props" to Christianity for making some commendable steps toward reason and humanity in the past few centuries. Even though Jesus Christ extolled the virtues of loving thy neighbor, Christians managed to rationalize murder, torture, and barbarism under religious pretenses for another thousand years. It's worth mentioning that it was not Christianity itself that rescued humanity from the fiery depths of its theocratic madness but rather a growing scientific enlightenment that has and continues to give way to a reasoned, secular discourse. This is ironic given the oft-repeated refrain that Christianity is a pillar of absolute morality and a bedrock of civilization. Ask yourself, "was the problem with the Inquisition that people simply weren't reading their Bibles enough or drawing up their to-do lists from God's orders?" 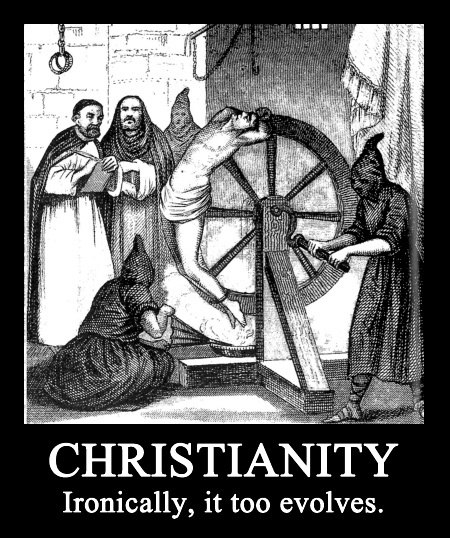 Apologists for the Inquisition, such as St. Thomas Aquinas or St. Augustine, managed to amalgamate the teachings of Jesus with the practice of flaying, dismembering, burning, stretching and gouging people to death. Whatever has changed in the past two thousand years, the tomes of religious orthodoxy have not. Historically speaking, though, it is still, at best, a little too early to tell whether this is wishful thinking or not. The 20th century witnessed not only the Nazi Reichskirche, but both Jim Crow in the US and South African Apartheid were closely allied with mainstream forms of Christianity. And today in the 21st century Pentecostalist/Charismatic Christianity is the fastest growing part of that religion and, in particular, is gaining in its political influence. Are you saying that the Qur'an supports the evil actions of some who claim to be Muslim, or they just twist it that way?